On the occasion of the victory of the Strike of Freedom and Dignity, the valiant battle of Palestinian hunger strikers in Israeli jails, confronting the occupier with their bodies and their lives, we salute the Palestinian prisoners on achieving their victory, not only for themselves and their families, but for the entire Palestinian people and global movement for justice and liberation. We salute and congratulate the prisoners on their victory after 40 days of sacrifice, steadfastness and endless struggle. We also salute and congratulate all those who contributed to this victory, throughout Palestine, in the refugee camps, in Palestinian communities everywhere and among strugglers around the world for justice and liberation. 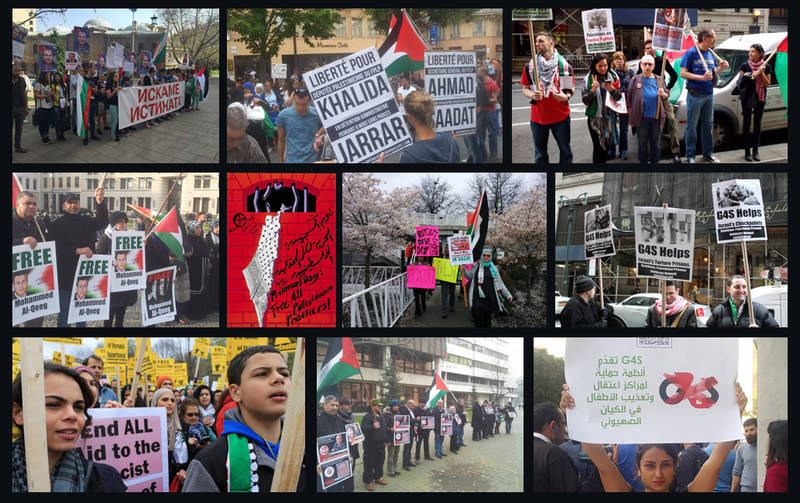 We simultaneously take this moment as an inspiration to continue and elevate our action and organizing for freedom – for all Palestinian prisoners and for the land and people of Palestine. On 17 April, Palestinian Prisoners’ Day, 1500 Palestinian prisoners out of nearly 6500 imprisoned in Israeli jails launched their strike for a series of demands. These demands were straightforward, focusing on the restoration of family visits, the right to education, access to media and health care. Among the accomplishments of the strike is the restoration of the second monthly family visit, cancelled last year by the International Committee of the Red Cross (ICRC) under the pretext of budget cuts, despite pledges from at least August 2016 to cover the costs of the second monthly visit for Palestinian prisoners. It is appalling that it should take a 40-day mass hunger strike of Palestinian prisoners to restore family visits taken away by an international agency that should be motivated by the rights and well-being of the prisoners. Far from a neutral bystander, the ICRC was in fact a party to this strike and a participant in the confiscation of the rights of Palestinian prisoners. This raises once again sharp questions about what really provoked the cut in family visits for Palestinian prisoners and the level of Israeli involvement in what was claimed at the time to be a mere financial decision, despite Palestinian pledges to cover costs. providing each prisoner with 1 liter olive oil, 1 kilo coffee, 1/2 kilo baklava and 1/2 kilo za’atar. The leaders participating in the strike included Fateh leader Marwan Barghouthi, Popular Front for the Liberation of Palestine General Secretary Ahmad Sa’adat, fellow PFLP leaders Kamil Abu Hanish and Ahed Abu Ghoulmeh, longest-serving Palestinian prisoners Karim Younes and Nael Barghouthi, Hamas leaders Abbas Sayyed and Hasan Salameh, Islamic Jihad leaders Zaid Bseiso and Anas Jaradat, DFLP leader Wajdi Jawdat, former long-term strikers Mohammed al-Qeeq and Samer Issawi, and hundreds more of the imprisoned leadership of the Palestinian people. Throughout the strike, the prisoners faced harsh repression. They were denied legal visits, family visits, beset by repressive raids, their belongings confiscated – even the salt that they relied on with water to preserve their life and health. Through it all, their steadfastness was an example of commitment and dedication to carry through their struggle. They were not alone in their steadfastness. The mothers and the families of the prisoners filled the tents of solidarity and support in every city, town, village and refugee camp in Palestine. Many prisoners’ mothers launched their own hunger strikes; they struggled, suffered, resisted and led alongside their children. Martyrs fell on the streets of Palestine as they protested and struggled for the liberation of their beloved prisoners at the hands of the occupation forces. The Palestinian prisoners made clear through the Strike of Dignity and Freedom the power of Palestinian unity. The imprisoned leadership of all Palestinian trends stood together to confront the occupier, while that unity was felt in struggle, on the streets and inside prison walls – and the effects of that unity have been felt in the achievement of the prisoners’ victory. The hunger strikers demanded that the Israeli occupation speak with their chosen leadership and defeated all attempts to circumvent the prisoners’ direction, leadership and choices. More than that, however, they demonstrated once again that the true, respected leadership of the Palestinian national liberation movement itself is found in the Palestinian prisoners’ movement. The Palestinian prisoners’ movement is at the core of the liberation struggle of the Palestinian people as a whole; far from a side issue of the movement, it represents the Palestinian people and their resistance. Fundamentally, the Palestinian prisoners’ movement is and remains a voice and a power of resistance that continues to confront the occupier on a daily basis. This strike was not only about family visits, medical care and basic human rights; fundamentally, it was an assertion of Palestinian resistance, rejection of the occupier, and power to struggle, not only for specific demands, but for freedom, return and liberation. The strike came as U.S. President Donald Trump visited the region, in cahoots with the Zionist movement, the Israeli state and the most reactionary Arab regimes in order to peddle weaponry, death and a so-called “grand bargain” designed to liquidate the Palestinian people’s struggle after 100 years of colonization, 70 years of Nakba and 50 years of intensified occupation. From within Israeli prisons, the strikers’ power and its reflection and resonance on Palestinian, Arab and international streets came to confront any and all such attempts to destroy Palestinian rights and push an apartheid “solution” of endless colonization. It made clear where the Palestinian people stand – with the prisoners, with the resistance and their imprisoned leadership, and not with reactionary Arab regimes or even the Palestinian Authority, which continued its security coordination with the occupation even as the prisoners, their families and their movement demanded that it come to an end. Throughout Palestine, in the refugee camps in Lebanon, Jordan and Syria, everywhere around the world in exile and diaspora, it was clear that the Palestinian people were side by side with the prisoners’ movement in this strike. The prisoners’ struggle helped to build and energize Palestinian community organizing internationally to support the strike and demand freedom for the prisoners. Samidoun Palestinian Prisoner Solidarity Network salutes all of the Palestinian community organizers, international political parties, global labor organizations, Palestine solidarity movements, women’s organizations, and strugglers for justice who organized hundreds of events in cities in every continent of the world, demonstrating again and again, developing creative protest mechanisms, taking the #SaltWaterChallenge, organizing one-day hunger strikes and building strength to support the Palestinian prisoners’ struggle. Historically the Palestinian prisoners have always emphasized the importance of international solidarity and support for their struggle for liberation. Every one of these groups and individuals who have taken action around the world has a part in this collective struggle and collective victory. Through their struggle, the Palestinian prisoners have escalated and developed growing support for the Palestinian struggle – in the labor movement, where major union confederations in Canada and Uruguay joined social movements in Brazil issuing resolutions in support of the strike, and even among parliamentarians, as the Portuguese parliament, the Pan-African Parliament, many Members of European Parliament, Argentine and Chilean parliamentarians, Galician and Andalucian parliamentarians, and even Canadian NDP leadership candidate Niki Ashton and US Congressperson Danny Davis – supported the prisoners. Perhaps most movingly, the power of internationalist solidarity between liberation struggles was vividly illustrated in the solidarity of Irish Republican, Filipino and Turkish and Kurdish political prisoners and the hunger strike of Arab Communist struggler for Palestine, Georges Ibrahim Abdallah, along with Basque and Arab comrades, in French prison in solidarity with the Palestinian prisoners’ strike, as well as the solidarity expressed from U.S. prisons. Palestinian prisoners celebrated the news of Puerto Rican struggler Oscar Lopez Rivera’s release from U.S. colonial prisons and rejoiced in the scene of his homecoming alongside former Palestinian prisoner and community leader Rasmea Odeh. The Palestinian prisoners’ movement and their struggle also further empowered and inspired campaigns for boycott, divestment and sanctions – from the establishment of HP-free zones in labor unions and community institutions to the inspiration of local boycott campaigns and initiatives, focusing on G4S, HP, academic and cultural boycott and the full boycott adopted by the LO labor union in Norway. The power and clarity of the prisoners’ resistance must encourage all of us to center the demands and struggle of the prisoners in building the global campaign for boycott, divestment and sanctions. On this occasion of the prisoners’ victory, we know that there is a long struggle to come, for liberation for the prisoners and liberation for Palestine. We urge all of the Palestinian communities, supporters of Palestine and social justice organizers who took to the streets, drank salt water, engaged in hunger strikes, expressed their solidarity and organized across borders and walls to celebrate the victory of the prisoners with events and actions on 4-6 June, in Celebrations of Dignity and Victory. In these celebrations, we will recognize the power of the Palestinian people to defeat the occupier and the colonizer, honor the prisoners and their steadfastness, and emphasize the ongoing struggle. These celebrations are an occasion to escalate our demands for Palestinian freedom – for the liberation of Palestinian prisoners, the Palestinian people, and the entire land of Palestine. Send your events and actions for the Celebrations of Dignity and Victory – Struggle for Palestinian Freedom to us at samidoun@samidoun.net, on Facebook, or use the form to tell us about your actions. We will be regularly updating this international list of events and actions. Building this strong list of actions around the world will help to underline the global support for Palestinian political prisoners in their struggle for freedom, and the struggle of the Palestinian people for liberation.